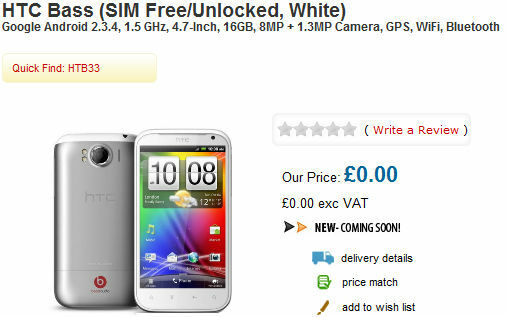 The still unofficial HTC Runnymede has popped up on a UK retailer's website only sporting a different name - the HTC Bass. Handtec lists the device as coming soon and hasn't given us a price yet. The supposedly-named Bass will have a single-core 1.5 GHz processor, 4.7-incher at the front, 8 MP main camera and Android 2.3.4 and offer the Beats Audio tech inside. Naturally the HTC Bass will also offer your garden-variety specs like Wi-Fi, GPS, multi-touch support, Bluetooth and the lot. Hold tight as this could end up being no more than a mistake by the UK retailer. In the off chance this is the real deal we may soon see the HTC Bass more and more. We did uncover some detailed specs of the thing a few days back - feel free to mingle on those until we see some further developments. Am running this on HD2 with android 2.3.5 looks very nice! !